Specialized Shiv stabbed by UCI. Astana scrambles for bikes, yikes. Time's up for the Shiv. Some famous racer once described a bike race as a knife fight. Well, Astana and Specialized just watched in horror as the UCI stabbed the Shiv to death. Now Alberto Contador, the race leader in the Volta ao Algarve, must scramble to find another bike for Sunday’s time trial. 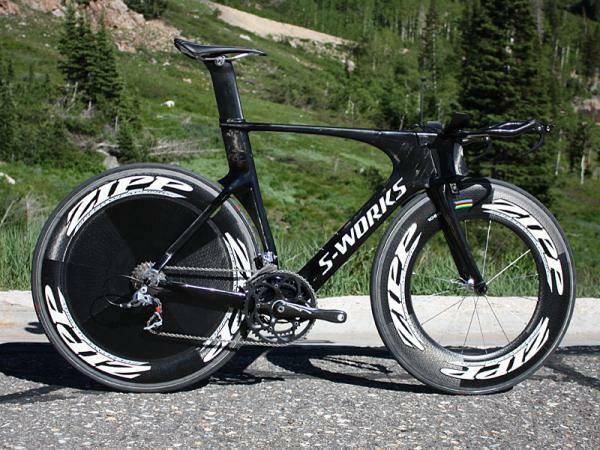 There’s an irony: time running out for new time trial bike. In any case, you can’t help but wonder about the organization of Astana in 2010. In their first race at the Tour Down Under, they forget to bring race radios. Hello? No response. Hello? Now, in Alberto Contador’s first competition this season, they don’t have an approved time trial bike. What’s next — forgetting to bring a bicycle pump and spare wheels? Now, Twisted Spoke is always ready to lend a hand in a dire emergency. This certainly qualifies. Word is that Specialized is flying in eight of the safer Transitions frames today, Saturday. But they still have to assemble them, size them and dial them in and mostly, pray for them. According to most folks, the UCI might not approve those time trial frames either. Because in part, they have the same almost exact nose-cone problems as the Shiv. Mechanics will have to cut pieces to get closer to regulation but may still not impress the judges. It’s like the figure skating judges in the Olympics– the Romanian judge likes the nose-cone but the Korean judge is thumbs down. Poor Alberto, even when your brother is your personal mechanic, things go wrong. In any case, Astana needs a Plan B just in case the Transitions frame is also stabbed by UCI inspectors. Here it is in a nutshell: don’t buy, rent. 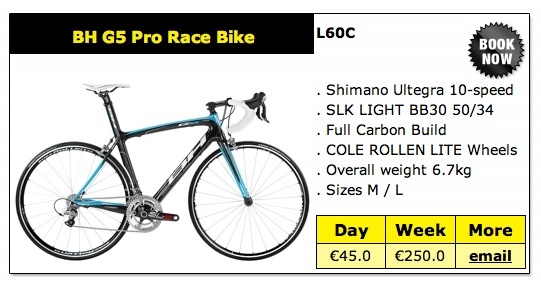 Cyclingrentals.com promises to rent a fast racing bike and “deliver it anywhere in Spain or Portugal, with bicycle rental from as little as €5 a day.” They throw in a combination lock if you want but skip that for the weight. That sounds like a great deal and even the penny-pinching Kazak management should jump on that bike. Now, this is a genuine carbon race bike, it’s as aerodynamic as possible and, listen closely — this is the big selling point — it’s approved by the UCI. Plus, this is a rental company so they just pull a dozen out of the garage and away you go, baby. Sure, Astana could maybe find a good bike store in Laguna, Portugal, where the time trial starts. But what are the chances, really, of the entire team dropping in Sunday morning and getting nine bikes? It’s like showing up at a small restaurant and all ordering the steak — there are only three sirloins left, my sad friend. Imagine the chaos — “okay, we got a Merckx for Alberto and uhh, a Pinarello for De La Fuente but I gotta check what we have in back… ” Bad news and time ticking. This is the race of truth and the truth is, Astana is out of time. Make the call right now. Because the Shiv is dead and the Transitions is still in deep doo-doo. Sure the rental bikes are a little slower but who’s riding it, right? Alberto Contador, that’s who. Just tell him to pedal faster. « Cancellara wins time trial and overall in Tour of Oman. Goodbye Abdul. Hysterical – thanks. Great site!! The UCI were just waiting for someone to drop the soap in front of them. Too bad Specialized didn’t get a chance to use the shiv on them. So Astana is still a team, eh? Good to know! Congrats on your new found status, btw. Glad to see you’re getting the kudos you deserve.